Waitsfield's Pine Brook Bridge is representative of classic kingpost truss construction. 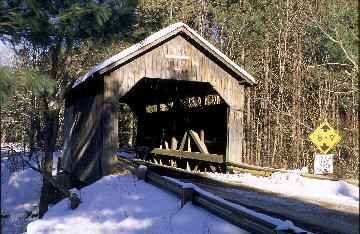 Built in 1872, it is one of Vermont's four surviving kingpost bridges and one of two that actually feature wooden kingposts. The other bridge retaining the wooden kingpost is the 37-footer John Moseley put over Northfield's Stoney Brook in 1899. The Pine Brook Bridge was restored in 1976 by Milton Graton and Sons. The forty-nine-foot span was in a poor state when Graton inspected it. The chords had rotted, a corner of the bridge had sagged almost a foot, and there were posts standing in the stream supporting the deck. Graton, in his book The Last of the Covered Bridge Builders, relates that the restoration had to conform to the then requirements of historic preservation to qualify for federal aid, so setting the bridge on a concrete pad and supporting it with steel beams would not do. He proposed setting the steel beams under the bridge one-half inch short of contacting the chords as a safety device for heavy loads. The bridge was raised a foot and a half to keep the deck system dry. The unmortared stone abutments were capped, the steel beams were installed, the chords and siding were replaced, and the roof was repaired. The floor was re-decked again in 1989. The kingposts in Vermont's two other "kingpost" bridges have been replaced with, constructed with, or augmented by, iron rods, the rods being superior to wood in bearing tensile stress. The Kidder Hill Bridge in Grafton uses iron rods one-and-three-quarter inches in diameter. These are suspended from timber braces eight inches square, timber being cheap, available, and possessing excellent characteristics to resist compression forces. The bridge, in its prime, was deemed strong enough to support wagon-loads of soap stone from the quarry on Kidder Hill. The other kingpost, or more properly, "king-rod" bridges are the pair that are part of Harrison Chamberlin's multi-span Scott Bridge in Townshend, and the Victorian Bridge by the Country Store in Rockingham. This last, an excellent example of 19th century bridge building, was constructed from the timbers of a queenpost bridge believed originally built by Harrison Chamberlin in 1872. The kingpost truss, in its simplest form, is found in frame buildings where there is a need to provide large spaces without columns or load bearing walls. The most common form found today supports the roofs of small commercial buildings and the ubiquitous post-World War II ranch- style homes those rambling houses with the low-pitched roofs and no useful attic space. These mass-produced roof trusses, found in any lumber yard, are descended from the structures used in the huge old barns and meeting houses that had cavernous interiors, constructed with post and beam and fastened with mortise and tenon. The kingpost truss was adapted to support the shorter bridge spans. It was probably first used with small open-work bridges, and it represented quite an improvement over stringer bridges, in which the trunks of trees were simply thrown over a stream. In the kingpost truss, a timber called the kingpost, is in effect, suspended by its top end by two diagonal timbers whose ends are braced on the ends of the chord above the abutments on each stream bank. The center of the chord is suspended from the kingpost. The weight of the bridge is transmitted to the ends of the chord through the kingpost braces. The kingpost braces are said to be in compression, squeezed between the chord-ends and the kingpost by the weight carried by the kingpost. The kingpost, being stretched by the weight of the roadway and the outward thrust of the kingpost braces, is said to be in tension. The chord is in tension as well, supported at the abutments and by the kingpost and stretched by its own weight and the weight of the roadway. As long as the truss, its joints, and its timber members are strong enough to bear the stresses of compression and tension, the bridge will stand. The carrying capability of the kingpost truss requires that the angles between the kingpost braces and the chords not get too small, meaning that a wider stream would require a really tall kingpost. The maximum practical span for a kingpost bridge is a little over forty feet. Longer spans require a more sophisticated truss. The queenpost truss, for example.